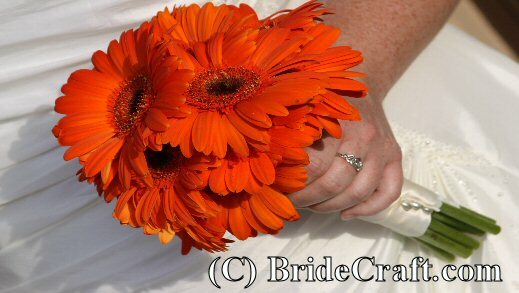 Do happy faced gerberas and the idea of a daisy bridal bouquet inspire wedding bliss for you? Less than blissful is the cost of a professional creating one for you? 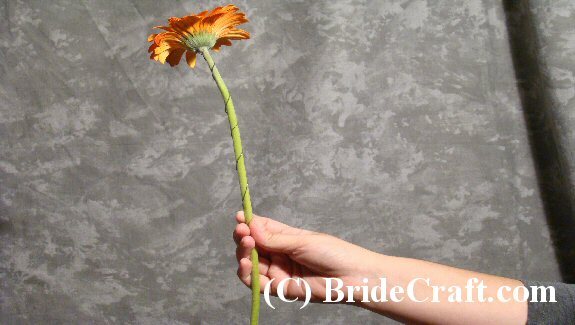 Then you’ll love this project for DIYing your own daisy bridal bouquet. Pros: This project is super inexpensive. 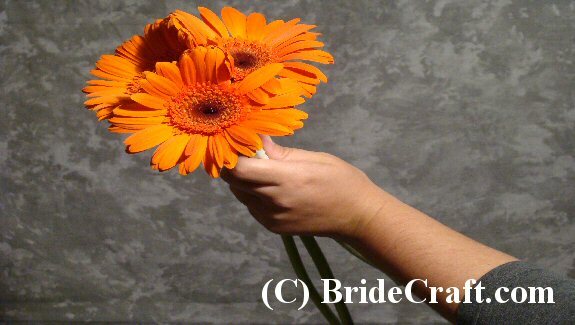 Gerbera daisies are available practically year round, come in a multitude of colors and are very reasonably priced. Cons: These flowers can be temperamental! Make sure the stems are cut and put immediately into water, lest the flowers get an air pocket and wilt. Also, gerbera daisies like to do their own thing…the heads bend all over the place. Don’t force the stems too much, or else they will break. 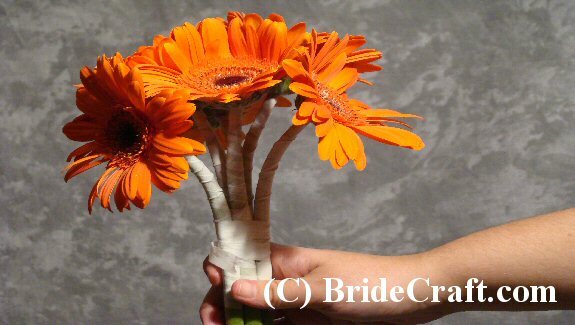 Step 1: You will need 12 to 18 gerbera daisies, green floral tape (white was used for this project due to availability), scissors, a sharp knife, 3 corsage pins, 12 to 18 sturdy but flexible gauge floral wires, ribbon and a piece of double sided foam mounting tape (not pictured). Step 2: Take a daisy and a piece of floral wire. Bend a small amount of the wire at one end, creating a 90 degree angle. 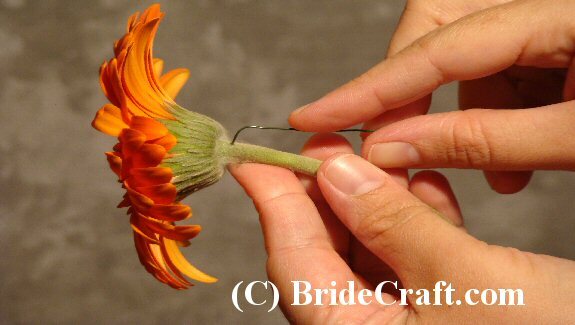 Press the small piece of wire into the stem of the daisy just under the head, as shown. Step 3: Spiral the wire down the stem of the flower, as shown. Step 4: Cover the wire with green floral tape. Do steps 2 thru 4 for the rest of the daisy stems. 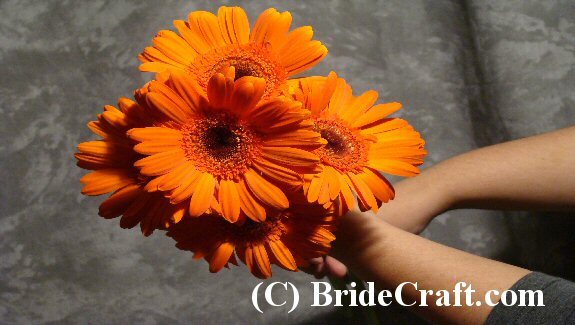 Step 5: Now that the gerbera daisies are prepared, you can begin arranging them. Begin with a grouping of 3 blossoms, as shown. When satisfied with you base of flowers, secure them together with green floral tape.Note: As you are arranging your bouquet, keep in mind the nature of the flowers you are working with. Gebers like to do their own thing! Don’t try to aggressively to force them into a position they aren’t inclined to go in. They will break on you or just not look right. Step 6: Begin adding other stems around the base that you have created. As you add stems, very gently angle them outwards, as shown. This will help to create a rounder shape. Note: Remember not to force the flower stem too much, or it is guaranteed to break! 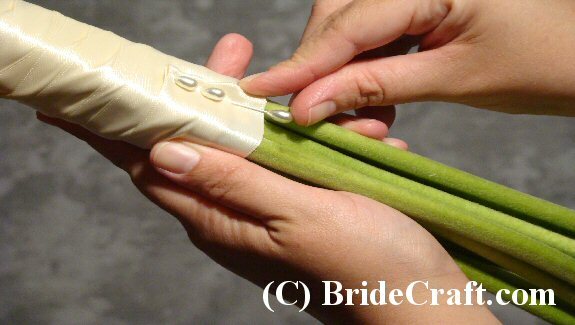 Step 7: Secure the stems with green floral tape as you go. Step 8: Keep adding stems, in a circular design around the bouquet. You may find that part of the bouquet becomes dominant. If that happens, place your flowers so that this blossom is the center of the bouquet. 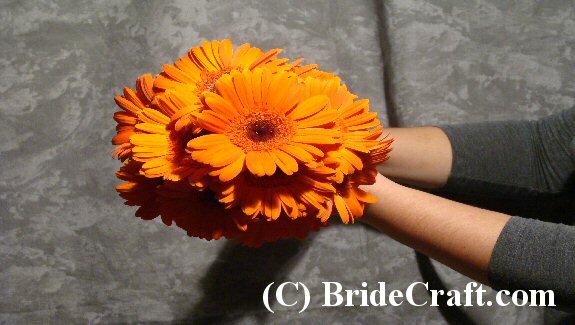 Step 9: Your bouquet should look something like this now. 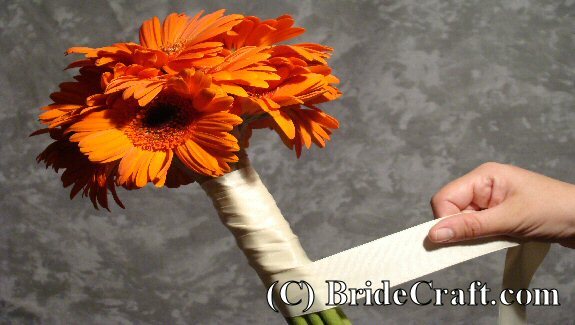 Step 10: Wrap your bouquet handle with your ribbon, starting at the top of the handle and winding downward. Tip: Use the afore mentioned double sided mounting tape to start the wrap. 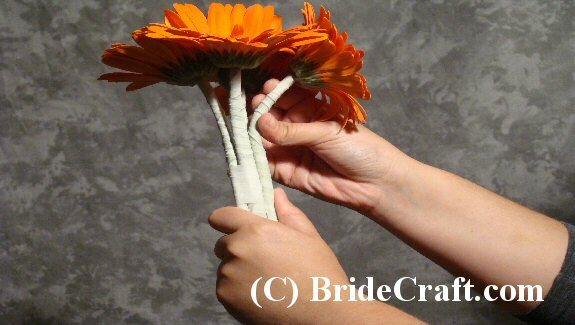 This technique is shown in other bouquet projects. 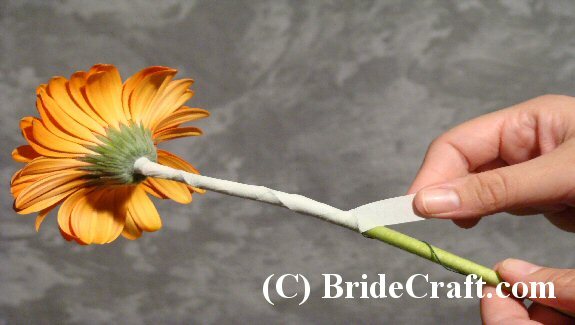 Step 11: When you’re ready to end the bouquet handle wrap, cut the ribbon and fold the ragged edge underneath itself so it doesn’t show. 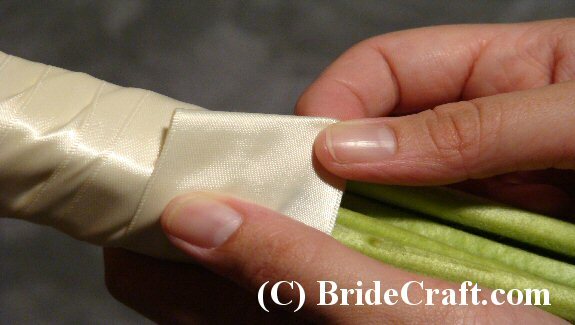 Step 12: Secure the folded ribbon edge with corsage pins. 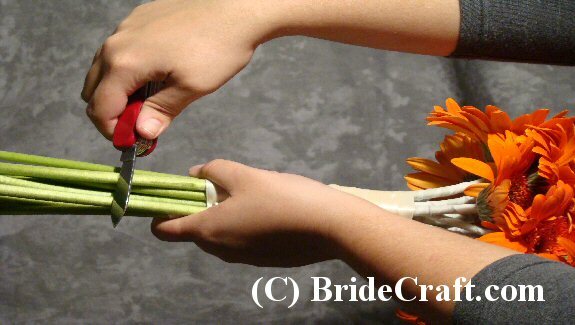 Step 13: Using the knife cut the stems evenly about 1 ½ inches below the bouquet handle. 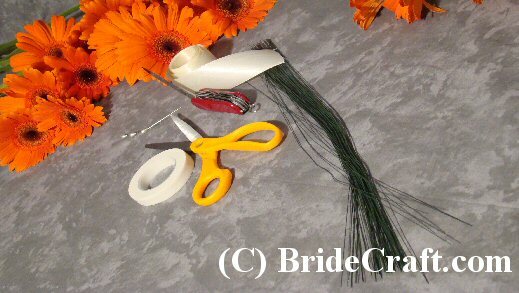 Step 14: And your daisy bridal bouquet is complete! Keep the bouquet in water until show time. Enjoy! 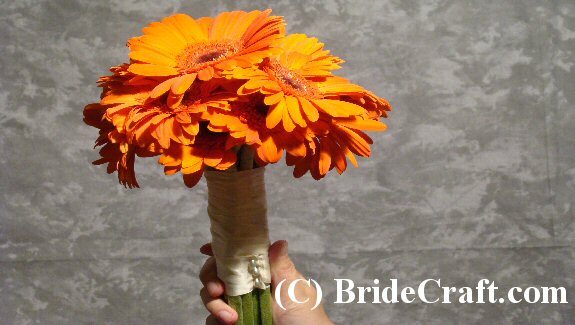 Return Daisy Bridal Bouquet to Bouquets.